name='keywords'/> Boomer, Sooner and Johnny-Come-Lately: The History of Norman Oklahoma: T. Jack Foster: Mayor, President of the Chamber of Commerce, and the Guy Who Brought the Navy to Norman. T. Jack Foster: Mayor, President of the Chamber of Commerce, and the Guy Who Brought the Navy to Norman. T. Jack Foster was a tenacious man. He had absolute faith in his ability to enhance the economic well being of the communities in which he lived. Norman has a number of individuals who stand out for their significance in contributing to the economic and cultural growth of the City. But none stand out as prominent as T. Jack Foster. Foster was born in Mineral Wells, Texas in 1902 and was the youngest of eleven children. He lost both parents when he was five years old. His two sisters raised him; T. Jack spent his the school year with his sister Mamie in Dallas, and his summers with his sister Mittie on a ranch in Oklahoma. He was a budding entrepreneur at an early age and found numerous ways in which to make spending money. By the time he was in high school, he started a newspaper delivery business. To expand his route, and out sell his competition, he borrowed his brother-in-law’s car and hired neighbor kids to toss the Dallas Herald newspaper on front porches from the back seat. He eventually had the biggest newspaper route in Dallas. He dropped out of high school in his senior year and opened a filling station, which he hoped would be the biggest used car outlet in the Southwest. Since his new business was not all that successful, he took the advise of his brothers to further his education at the University of Oklahoma. Foster applied for and passed the University’s entrance exam, not fully disclosing his lack of high school diploma. While at the University of Oklahoma, Foster started University Cleaners on Campus Corner. He stumbled into this opportunity by helping to fix a deliver boy’s broken down motorcycle, which was loaded with clean cloths ready to be delivered to customers. In 1921, T. Jack married Gladys Hutchins. While Gladys finished at the University, Foster dropped out of school to run his business. Upon graduation, Gladys took over the business and T. Jack enrolled in the University of Oklahoma’s Law School. By 1928, Foster’s cleaning business had 23 employees and a yearly payroll of $75,000. In 1929, a group of Norman businessmen drafted Foster to run for Mayor of Norman. There was little opposition and T. Jack won. He was the first student mayor in the United States. The biggest issues facing Foster as mayor was an extensive road-building program and city infrastructure upgrading. He was an on-hands mayor. Curious about the materials used in the upgrade of the city’s infrastructure, he traveled at his own expense to a factory to see how sewer pipes were made, making sure the Norman had the best materials available for the needs of the City. This facet of his personality came into play in every endeavor he would encounter in his business life, from mining to home building. Foster was not only an entrepreneur, but an inventor as well. He developed a fire proof building brick made of adobe clay and asphalt. He used this technology in the construction of a new motel in Norman in 1938. The only other hotel in town was the old University Hotel on Main Street. 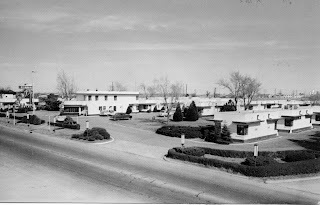 Foster’s motel was the 62 room Norman Courts, which was located at Porter and Robinson along Route 77. The Courts was rated one of the five best motels in the country in 1939. In 1938, T. Jack Foster recognized that Adolf Hitler’s aggressive march across Europe in the 1930s would eventually evolve into a second world war, and if the United States played a part in helping the allies in the war, there would have to be a homeland effort to prepare for such a war. As Vice-Chairman of the Norman Chamber of Commerce, Foster conferred with University of Oklahoma officials about the University taking a role in developing a war defense program in the University’s Aeronautical Engineering Department. Foster also believed that an adequate size airport would be needed for civilian training. Although Foster considered that Cimarron field in Yukon could be a nucleus for an airport, there was not enough land for an adequate airfield. At the same time, the University of Oklahoma began to talk about establishing an airfield, realizing the importance of a flight-training program for the security of the nation. The first step toward that goal was the acquisition of land for an airfield. A gift from Walter Neustadt and the Max Westheimer estate for $10,500 provided the means for the University to establish an airfield in Norman in 1941. Shortly after Max Westheimer airfield became a reality, the Japanese attacked the US Fleet at Pearl Harbor on December 7, 1941. The newly established Max Westheimer airfield played an important role in convincing the Navy to establish a flight school and technical training center in Norman. In January 1942, the Chamber of Commerce sent T. Jack Foster and Neil Johnson to Washington to talk to the Army or the Navy about establishing training facilities in Norman. The University sent Savoie Lottinville, Director of the University of Oklahoma Press as the University’s representative, Lottinville was already in the East for a convention. Working through Oklahoma Senator, Josh Lee and State Representative Mike Monroney, the trio from Norman was provided with several contacts at the Departments of Navy and Army. After two weeks of meetings and no results, Lottinville and Johnson returned to Norman. T. Jack Foster stayed and wrote more than 18 proposals outlining what Norman had to offer in supporting training facilities. The Navy had many questions about sufficient housing, infrastructure, classrooms, air space clearances from other government airfields in the area, like Tinker Airfield to the north, and how many days of good flying weather was possible. Foster found the answers to all their questions and finally convinced the Navy site selection committee to visit Norman. After the Navy site selection committee found Norman a good place to develop a flight training program, the City of Norman, a town of around 11,000 citizens, began to prepare for Navy personnel. City residences were told in one newspaper editorial after another that there would need to be good clean rentals at fair rental prices. Citizens were also encouraged to clean up their lawns, ally-ways, and to paint their homes to make Norman a bright star on the Prairie. The Navy invested a lot more in Norman than the University and the Chamber of Commerce first thought would be possible. Besides an air-flight training program north of the City at Max Westheimer airfield, the Navy built a technical training program southwest of the University, a small city of 20,000 Navy personnel, and twice the size of Norman. What a military installation meant to Norman, and what businessman T. Jack Foster realized from the beginning of his efforts in 1938, was economic growth and improved infrastructure for the citizens and the City of Norman. The needs of the military installations provided many changes in Norman during the war years. For example, Norman didn’t have a sewage plant. There were two main sewage lines and both of them emptied into the South Canadian River. That presented a problem for the 20,000 residences at the Navy Technical Training Center, or South Base, because one of the lines emptied just south of the base. In the summer, when the river was down, the sewage line emptied onto dry land, the breeze from the south was not pleasant; the first of Norman’s sewage plants was built at this time. Also, many roads were resurfaced or paved for the first time to give access to the bases. These are only a few examples of the many changes that took place in Norman because of the improvements that were necessary for the functioning of the military installations. Foster continued his economic interest after the war, but not in Norman. After WWII, he invested in pumice mining in New Mexico; pumice helped him to produce fireproof concrete. Soon after, Foster moved his interest to home building. He won a bid from the federal government for 18 million to build houses on military bases after the war; he built at Biggs Air Force Base in El Paso, Texas, and Fort Ord in California. He went on to build residential communities in California, Texas, New Mexico, Kansas and 25-foot Foster Tower in Honolulu, Hawaii. In 1958, T. Jack and his wife moved to Pebble Beach, California. Although retired, he interested his sons in helping him to build a planned community outside San Mateo, California. Foster and sons took marchland on the west side of the San Francisco Bay and hired the best engineers to provide the foundation for Foster City. 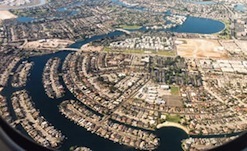 Today Foster City thrives as a very successful community of bayside homes with docks and boat launches. T. Jack Foster grew up in a time when economic survival relied on hard work and a keen eye for opportunities that eventually helped to him to gain financially. Once he had capital from his varies businesses, he reinvested in something bigger and more lucrative. When he saw the opportunity to convince the military to consider Norman for training installations, he made it his goal to obtain the Navy bases, and he was successful in that endeavor. Norman became a productive modern city in the 1950s because of the foundation that was laid during the war years. We can thank T. Jack Foster. T. Jack Foster died of liver cancer in 1968 at his home in San Mateo, California.